He retired as one of the Yankees' most successful and popular managers - leading the team to 6 AL Pennants and 4 World Series Titles. Joe Torre amassed over 1,100 regular season wins and a .618 post season winning percentage. There is little doubt why Joe Torre takes his place in the National Baseball Hall of Fame this summer. As a tribute to Torre's success and leadership Louisville Slugger has created this very special Commemorative Bat featuring Torre's records and accomplishments as a Major League manager, as well as stats from his playing days. 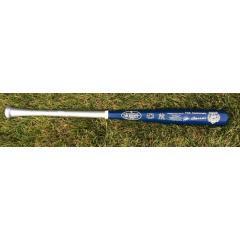 This official size Louisville Slugger two-tone bat is personally signed by Joe Torre and honors Torre as he takes his place among the game's greatest in Cooperstown. Add this special piece of autographed memorabilia to your collection before it is gone. Due to the limited nature of this bat we must charge your credit card for the full amount immediately upon taking your order. This policy ensures we reserve a bat from the series for you. We will confirm your order by e-mail. This bat is not game used. Please allow 4 to 6 weeks for delivery. Joe Torre Signed Hall of Fame Commemorative Bat $495.00 Sold Out!